If you are the one who knows what card counting is and which counting systems are considered to be a basement for more complicated strategies, then Omega II will be nothing completely new for you. This counting system is developed for experienced players because it includes more complicated methods of counting cards which demand a good memory and great concentration from a player. The first person who told about Omega II counting system was Bryce Carlson, and he did it in his book Blackjack for Blood; it happened in 2001, so, Omega II is a relatively new system of counting cards at blackjack. It is very efficient indeed: the efficiency level of this system is almost 99% which makes Omega II being quite profitable for gamblers. Surprisingly, but Omega II does not differ much from Zen Count System: the principle is the same but the values of cards vary a bit. The main point to remember is that Omega II counts Aces as neutral cards; so, you should not add or subtract any points from your total when an Ace appears from a shoe. It means that you should keep Aces in your mind. The principle of Omega II is the same with other counting systems: you start your counting with zero and add or subtract a number of points for every card which is dealt from a shoe. The cards of a dealer and other players at the table are also counted. 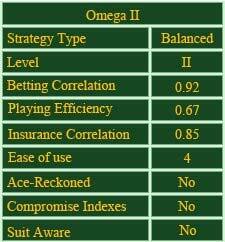 Omega II is a balanced system which means you should start and end your counting with a zero. As well as other systems, Omega II advises you to make low bets every time when your count total is low or negative and make big bets every time when your count is positive and high. If you are a professional card counter, it should be interesting for you to learn one more blackjack counting system which had been developed by the well-known guru of blackjack card game - Ken Uston - and is called to be Uston APC Count.